Asian cuisine comes from the vast regions of Asia—China, Japan, Vietnam, Thailand, Korea and Mongolia to name a few. Each of these regional categories of foods have numerous sub-categories that further define the region or district from which the food originates. Chinese food has eight main regional cuisines, known as the Eight Great Traditions: Anhui, Cantonese, Fujian, Hunan, Jiangsu, Shandong, Sichuan and Zhejiang. There are even further sub-categories of Chinese within the Eight Great Traditions. In keeping with traditions adopted here in the United States, every Asian meal concludes with a fortune cookie containing a piece of paper with a clever quote or ambiguous prophecy. Have you ever wondered where the fortune cookie came from? It wasn’t China—in fact, fortune cookies are not even served in China. Fortune cookies originated as a Japanese-American confection known as a “fortune tea cake.” During World War II, Japanese-Americans were placed in internment camps on the West Coast after Japan bombed Pearl Harbor and Americans feared every person of Japanese descent. Enterprising Chinese business owners jumped into the void created by the detained Japanese-American fortune tea cake manufacturers and began making “fortune cookies.” The popular sweet treat has been associated with Chinese food ever since. In the January/February 2019 issue of Rochester Women magazine, “Celebrate Chinese New Year,” I wrote about our visits to Asia Fusion and Hunan Garden. Continuing our exploration of Asian restaurants, my husband and I dined at Pho Chau in Rochester. This wildly popular Vietnamese restaurant on north Broadway was a bustling hive of activity and the guests were clearly enjoying their meals. We ordered a couple of appetizers which magically arrived moments later. The cheese wontons were crispy on the outside and hot and creamy inside. They were prepared perfectly and to say they were delicious is an understatement. The pork and shrimp spring rolls were also cooked to perfection and contained generous portions of shrimp and pork. We thoroughly enjoyed both appetizers and appreciated the prompt and polite service. For entrees, we ordered the beef stir-fry and the shrimp stir-fry with mixed vegetables. The beef stir-fry arrived with plentiful portions of meat and the crisp-tender veggies were wonderful. The shrimp stir-fry was fantastic: the jumbo shrimp were cooked perfectly, and the veggies were also cooked just right. Both entrees were sizable portions, enabling us to bring some home for the next day’s lunch. 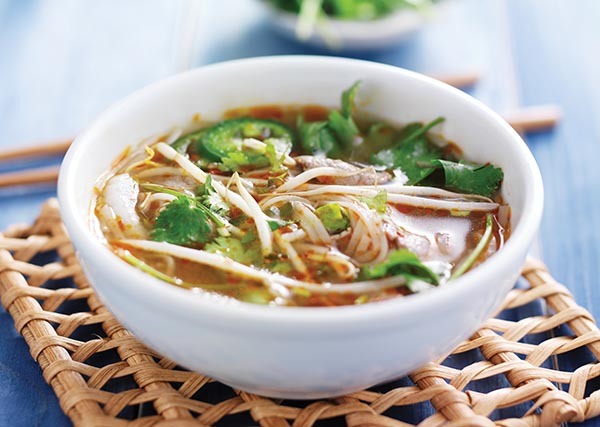 Pho Chau is a relatively small restaurant, but because the staff is so efficient, they were able to serve customers quickly—accommodating both dine-in and takeout—with ease. As soon as one table of guests left, it was quickly cleared, and new guests were seated immediately. We never felt rushed, which we appreciated. We definitely enjoyed our visit to Pho Chau and plan to return soon. Does all of this talk about the origins of Asian foods leave you grasping for your chopsticks? No worries, all you need to have is an adventurous spirit and a willing palate. There are numerous amazing Asian restaurants to explore in Rochester. While they are similar in nature, each is unique and special in its own way. The owners and menus reflect their unique history and experiences. If you have time and interest in cooking Asian cuisine, experiment with this tasty spring roll recipe. Get creative and add shrimp or pork or any ingredient of your choosing—that’s the fun thing about Asian food, you can create numerous variations to one basic dish—and it’s like a new dish each time. Spring rolls are the vegetarian super-light, crispy and tender vegetarian appetizer cousin of the traditional egg roll. Spring rolls are usually eaten during the Spring Festival in China, hence their name. Add half of the canola oil to a large heavy skillet. On medium high heat, add in the napa cabbage cooking 8-10 minutes while stirring until almost all the liquid it releases has cooked off. Next, add garlic, carrots and bamboo shoots and cook for 1 minute while stirring. Then add mirin, soy sauce and sesame oil while stirring. Let filling cool completely. Roll out the spring roll wrapper, brush cornstarch slurry around the edges to moisten and add about 2 tablespoons of filling in a long rectangle shape, folding in from the sides and rolling the wrappers closed tightly.